Some of my favourite books were about mothers and daughters. They remind me of my relationship with my own mother. It’s not perfect by any means, but I love her with all my heart. I know she feels the same way about me. My own love for my two daughters can’t be put into words. I would do anything for them and only want to see them happy. I now understand the hard choices my mom had to make raising me as I struggle with the same things now that I’m a mom. Most recently, I read The Island by Elin Hilderbrand. It tells the story of an aunt, mother and her two grown daughters. I loved it so much that I thought I would look for other books that touch on the mother-daughter relationship. Mother’s Day is coming up next month and May is also the month we celebrate mom (though every month is the month of mom in my books). 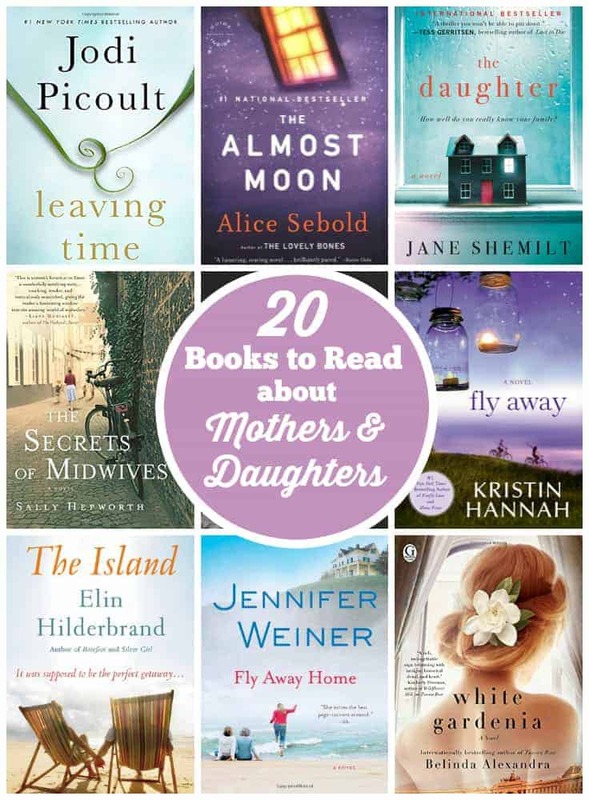 I’ve rounded up a list of 20 books to read about mothers & daughters, including my most recent read, The Island. I have a few of these books already on my TBR shelf. Have you read any good books mothers and daughters? Leaving Time is one of my favorite books ever. I cried so hard! I love Jodi Picoult! I haven’t read that one though. This looks like a great list. Thanks for sharing it! Having 2 daughters myself this is a great suggestion list! I love to read and I want to read the book you talked about called the Island. It sound very interesting and I love to read books that are inspiring! Thanks for a great list of books to check out. Thanks. What a great collection! I’m glad you thought of even sharing a list like this. My daughter is grown, and it would be great for us to pick one and both read it. What a lovely list of books. Thanks for sharing! I am going to put several on my to-read agenda. I love to read and will soon need some new selections. I have read some of these books, but I will try some more of your suggests soon. I would like to read the book you wrote about called the Island.